Strangely, it is women who render themselves effectively to the cinema of loss and bereavement. Don't men suffer when they lose someone precious? In a subtle sly way, debutant director Sanjay Nag's "Memories In March" poses this question on gender attitude towards loss and tragedy. In a script tenderly crafted by Rituparno Ghosh, Nag has a woman and a man locked together in the chamber of shared grief. Memory and its deeply-reflective recollection after death are a recurrent leitmotif in Ghosh's films. In the Ghosh-directed "Sob Charitro Kalponik ", Bipasha Basu fell in love with her husband Prosenjeet after his death. 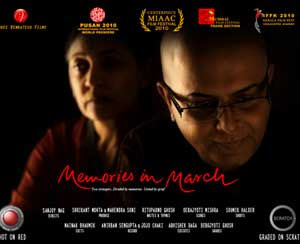 In "Memories In March", which Ghosh has scripted, the mother discovers the dark side of her son who she thought she was very close to after his death. Aarti Mishra (Deepti Naval), a no-nonsense divorcee from Delhi, arrives in Kolkata after her only son's sudden death in a car accident, to close the account of her son's life and pick up the son's remnants that would, perhaps, serve to sustain her for the rest of her life. In Kolkata, Aarti meets a gentle middle-aged man Arnab (Ghosh) who turns out to be a close friend of her son...much closer than she, the mother, would have liked him to be. The sequence on a steep staircase where the mother is told by her dead son's affable colleague (Raima Sen) that her son was in a gay relationship with Arnab, is expertly executed to eschew tears while milking the situation for its insinuated poignancy. "Memories In March" is excellent at building individual moments of crisis and catharsis between characters during a time that's stressful beyond imagination for all concerned. However, the sum-total of the moments does not quite add up to that tremendous eruption of emotions that one would accept in a film about a mother's journey into her dead son's secret life. Often the narrative holds back emotions, more to appear European in spirit than to be in character with the script. As played by Deepti, the mother is a portrait of restraint breaking down just once when no one is looking in an open refrigerator and that too with such furtive fury, you wonder if she's holding back the tears for a time when the camera doesn't pry. The narrative's structure and its journey from crisis to reconciliation is so tentative that you wonder if this moving portrait of a mother coming-to-terms with her son's death and dark secret about his sexuality doesn't lose out on something vital in its effort to imbue a cosmopolitan hue to the emotions. Having said this, the detailing of the emotions and the nuances inherent in the ambience cannot be faulted. The film creates a scintillating synthesis of suburban sounds and the intangible sound of hearts shattered by unforeseen tragedy. Incidental sounds, such as children running down the stairs of the dead son's apartment block, or the old-fashioned rickety lift creaking to a start at a decisive moment in the plot, lend a workaday grace to the poignant proceedings. The time passages seem cramped, uneven and, lamentably unconvincing. The narrative crams in the mother's bereavement, acceptance of her son's homosexuality and her bonding with his gay lover in a fashionably condensed one-brief-moment-of-grief weekend. Again, a European affectation. Soumik Haldar's cinematography and Debojyoti Mishra's music invite attention to themselves slightly more insistently than the characters who remain suspended in muted melancholy. At times you wish to push the proceedings to a higher octave, if for no other reason then to see if these internally-suffering characters can express their pain more forcefully. "Memories In March" is a ball of impenetrable anguish that implodes once in while. When it does, the little shards of pain and hurt pierce your soul. The bond between two unlikely mourners, who become one in their collective grief, remains with you long after the last shot of a fish tank lying bereft and a voice message unattended after an irreversible tragedy. This is a work of bridled pathos made remarkable by Deepti and Ghosh's delicately-drawn performances. If you enjoy cinema that provides emotional catharsis, this one is for you.